If you own a rotary screw compressor and have been faced with the high cost of a factory Airend, you now have a better choice. CMS Airends is one of the largest aftermarket rebuilders in the world and has been servicing and rebuilding rotary screw compressor airends since 1977. Our 20,000 square foot facility houses the latest equipment. 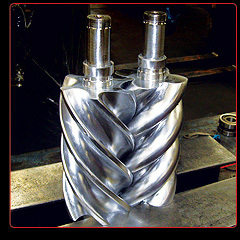 We maintain a complete machine shop, fabrication shop, welding shop, and metalizing shop. Energy costs are rising, and air is a big consumer of energy. If an airend losses efficiency it directly translates into higher energy consumption and thousands of dollars. Your airend is a critical component of your compressed air system. CMS airend reconditioning program insures that your airend will be brought back to its original factory performance. We do this by verifying Polar Coordinate Measurements, Axis Testing, and using Manufacturers Spec for tolerances and standards. You can depend on CMS quality assurance and two full year warranty on parts and labor.